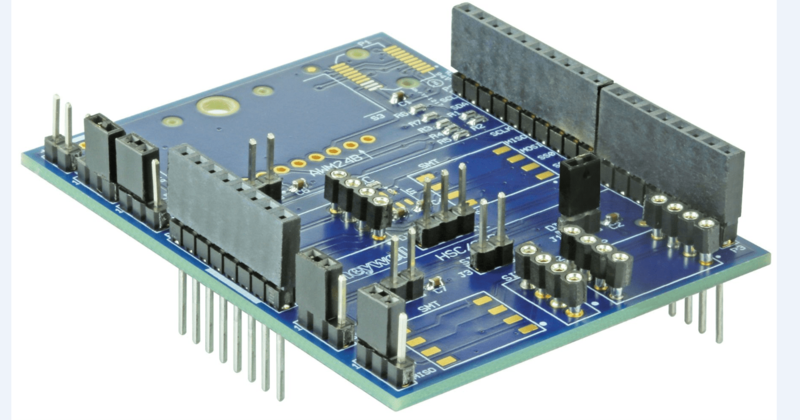 The Sensor Evaluation Kit, SEK001, provides an easier way to demonstrate and evaluate Honeywell’s TruStability RSC Series, and the digital output versions (I2C or SPI) of the HSC Series and SSC Series Board Mount Pressure Sensors. The kit interfaces a selected sensor to an Arduino™ Uno Rev3 Microcontroller Board. Honeywell software, which is providedfree and is downloadable at http://sensing.honeywell.com/ sensors/evaluation-kit, controls the Arduino Uno Rev3 to take readings from the sensor. Sensor measurements are displayed on the user’s PC and can be recorded to a .csv file for further analysis. In addition to being mounted directly on the SEK001, the sensor may also be remotely connected to the SEK001 via wire leads, allowing the sensor to be tested in adverse environments, or in a prototype product for proof of concept testing. the customer to develop any code before seeing sensor measurements. Remote mounting: In addition to being mounted on the SEK001, the sensor may also be mounted remotely if, for example, it is to be mounted in an oven for testing or in a prototype product for proof-of-concept testing of the customer’s end product. Cost-effective: Provides a cost-effective way learn about the capabilities of our sensors so customers can make better informed component decisions faster. Customers are then able to perform a thorough evaluation of the sensor without needing to develop additional code. Expedites development: As the SEK001 allows customers to test their product, this helps customers to expedite their development process. Five jumpers for an HSC Series or SSC Series, I2C output, 5 Vdc pressure sensor are preconfigured on the board. Honeywell’s Sensing and IoT business, part of Honeywell Safety and Productivity Solutions, helps original equipment manufacturers enhance the precision, repeatability and durability of their products with custom-engineered sensors, switches and machine safeguarding. Honeywell offers more than 50,000 solutions that are featured in products ranging from breathing machines and airplanes to oil rigs and construction equipment.